I first encountered empanadas in a panaderia down in Nuevo Laredo on one of my regular weekend trips back in the '70s. They reminded me vaguely of Hostess Brand fried pies, except they were filled with a sweet potato mixture that was tasty and exotic, and they weren't as greasy. I was never a big fan of the pan dulce, but I sure did like those empanadas. I always had the vague idea that it would be nice to make them, but the big bad piecrust kept me from making the attempt. Every once in a while I would wistfully imagine eating one, but never enough to do anything about it. 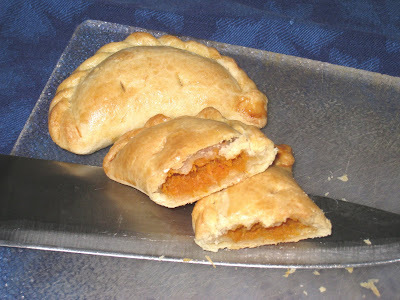 Once I started practicing on my pie crusts, the idea of making empanadas came back into my thoughts. And once I felt comfortable enough making pies, I decided it was time to try. For my first effort, I just used the pate brisee recipe I found at Elise's Simply Recipes. While not bad, it was not optimum. Oddly enough, it was a little too flaky for the purpose, and I didn't crimp the edges of the dough together enough so the filling seeped out some while they were baking. Luckily, it did not make a mess, but I realized I needed to find a dough that was sturdier than the delicate pie crust which I had grown accustomed to making. A brief internet search led me to a recipe that looked easy enough, so I went to work. I love that you can make pastry dough in the food processor. It's funny, but I only use it for pastry dough. 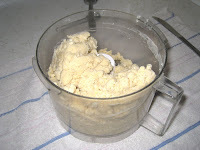 I mix my biscuit dough by hand. It gives me more control I think, and keeps the biscuits more tender. But for pastry dough it's the food processor all the way. I have always heard that you should process the dough until it forms a ball, and guess what? That's exactly what it does. Its like boiling water - you will know when it's ready. From here on out, it's just like the Pate Brisee - you divide it in half, let it chill, then roll it out. For the filling, I roasted some sweet potatoes and mashed them up with some raspberry syrup and chipotle sauce. I didn't worry that I made a lot more of the mixture than I needed. I just threw what was left into a pot, added some vegetable broth, gave it a quick blast with the hand blender, and enjoyed some killer sweet potato soup. After I rolled out the first disk, I cut approximately three-and-a-half-inch diameter circles using my super duper cookie cutter. It was easy to make; I just used the can opener to remove the bottom of can. It's the perfect width. And it pairs quite nicely with the 14-oz. coconut milk can I use to cut out my flaky buttermilk biscuits. 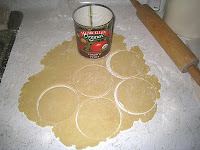 After I cut out the circles, I stack them two at a time between wax paper. Then I put them in the refrigerator for at least half an hour, so they would get nice and cold. As with all things pastry, you don't want the dough to get too warm or the butter will soften into the dough and it won't be flaky when you bake it. Did I mention that this is a time-consuming process? 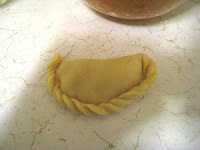 To make the empanadas, you separate an egg and use the egg white to help seal the ends of the dough together. 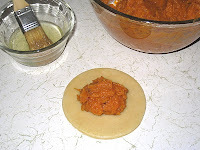 You brush it around the edge of the circle, then put a tablespoon of the sweet potato mixture in the center. You want to be sure not to use too much filling. You have to be able to close the dough completely over the filling, without any leaking out. With a loose filling like mashed sweet potatoes, you have to be especially careful because it squishes so easily it seeps out before you even know it. One trick to keep it from coming out is to close the dough over the filling and then start squeezing the ends together after it's already closed. You can see it better if you click on the picture - you want to smush the two edges together and stretch them out a little. That will make it easier to crimp the edges together. Once the edges are sealed pick up the pastry and hold it in one hand. Using the other hand and starting at one end, fold the edge over itself and press firmly, and then fold the edge right next to it so it overlaps and press that firmly as well. Continue all the way around the edge until the whole side is completely sealed in on itself. If you've done it right, the filling won't come out while it's in the oven. And here they are all rolled and ready to go. Well, almost. Remember I mentioned that this is a lengthy process? After they're all rolled, you want to brush them with an egg yolk (the one you separated from the white you were using to seal the edges when you were putting them together) mixed with milk. Then you pierce them with a knife and put them in the refrigerator for half an hour. Why do you do this? I don't know. But the first recipe I looked at said to do that, so I did. I'm thinking it must have something to do with letting the butter chill up again before you put them in the oven. And 30 minutes is how long it takes for the oven to preheat, so I turn on the oven at the same time I put them in the refrigerator. And this is how they look fresh out of the oven. It always amazes me how pretty they look. Of all the new things I have made this year, I think I am proudest of these. 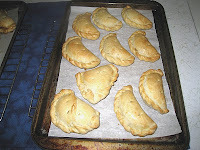 I have since made them with different meat and potato fillings, and they have all been amazingly delicious. Are they time consuming and a lot of work? Well, yes. Are they worth it? Hell yes! Wash the sweet potato and pierce it in several places with a fork. Roast it in a 350 deg. F. oven for 40 to 45 minutes, until it is soft. Let cool. Peel it and mash it with the syrup, adobo sauce and chipotle. Season to taste with the salt and pepper. Roll out the emapanada dough and cut into either 3-1/2" rounds or 2" rounds (for appetizers). Put them in the refrigerator for at least 15 minutes (or as long as 24 hours) to let the butter re-chill. 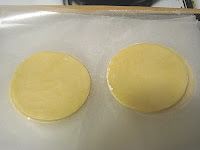 Remove the rounds from the refrigerator and line two baking sheets with parchment paper. 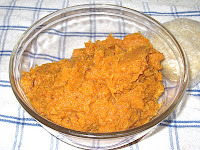 If using the larger rounds, place 1 tablespoon of the sweet potato mixture in the center of each round (use 1 teaspoo if you are making the appetizer size). Brush the egg white around the edge of the circle and fold the dough over, being sure that none of the mixture escapes out from between the two layers of dough. 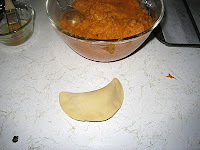 Fold the edge of the dough over itself and press firmly to seal it, repeating all the way around the half circle until the piece is completely sealed from side to side. 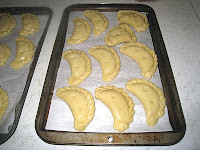 Place on the baking sheet, leaving an inch between each empanada. Continue until all the rounds have been filled and sealed. Brush each empanada with a mixture of the egg yolk and 2 tablespoons of milk, then pierce each one twice with a sharp knife. Preheat the oven to 400 deg. F. Place the baking sheets in the refrigerator and chill for half an hour. Bake the empanadas for approximately 30 minutes, until they are golden brown. These can be eaten warm or at room temperature. If you store them in the refrigerator, they are best reheated in a 350-deg. F. oven for 10 minutes. mixture begins to form a ball. I hope they compare favorably with your mother's recipe! They do require some work but I think you will find they are well worth it. I hope you will let me know how they turn out for you!